Add wine to cheese sauce. Stir to combine. Cook scallops in butter. Add to plate. 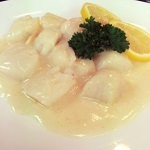 Top scallops with white wine cheese sauce.